You got a boat load of gifts from friends and family? You Lucky dog! Well, now its time to write some graduation thank you notes. It'll be fun. Here are a few pointers to get you started. Personalize each note: Cookie cutter notes won't do here. If someone was nice enough to give you a graduation gift, take the time to address them personally. Mention the Gift: If the person to whom you're writing got you something nice, describe how happy you were to receive it, and tell them what you plan on doing with the gift. People love imagining their gifts in action. Especially old people. 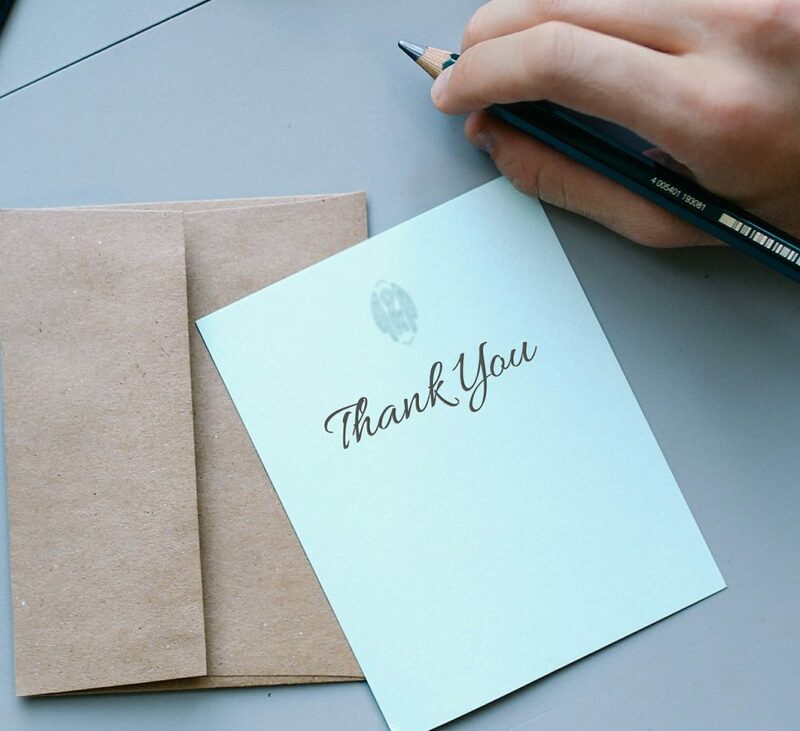 Keep it Casual: There is no need to be overly formal with your graduation thank you notes. You're writing to your friends and family. They love you. You love them. Keep it short, sweet, and tongue in cheek. Thank you so much for taking the time to come to my graduation ceremony! Words can't express how happy I was to see you sitting there when I walked onto the stage. The family and I are looking forward to seeing you next week for our dinner. Please give my regard to Aunt Jane as well! It was a really awesome moment for me to see you there an my graduation ceremony. Not only was it awesome that you were able to attend, but you made my day by gifting me such a great book. I hope Iâ€™m able to finish it before my university classes start back up in the spring. Otherwise, I donâ€™t know how I'll study. Thank you so much for giving me my first watch for my graduation. I have always wanted a mechanical watch, and I plan to wear it daily for years to come. I wish that you could attend the ceremony, but I understand that some commitments cannot be avoided. Hopefully we'll have some time to go camping once things die down at the office- I'm thinking Canada this time around. Hope to hear from you soon! I was really happy to see you at my graduation ceremony. There arenâ€™t many times where you can sit back and feel like youâ€™ve accomplished something. Iâ€™m so glad you were able to be there to help me celebrate this moment for me. I hope you and Julie can come to my university after I settle in there. Thanks for being the best Granddad of all time. It wouâ€™dnâ€™t have been the same without you at my graduation. Thank you for coming to my graduation ceremony at the college. It was such a lovely day to have all my friends and family there. The weather held out so we could have the ceremony outside rather than crowded in the school gym. That made me so happy. I also want to thank you so much for the wonderful gift you gave me, it really wasn't necessary, but is well appreciated. Mom and dad were glad to see you, glad you could come to the party and celebrate with the whole family. I hope to see you soon! Thanks a ton for the graduation money. It will help me immensely in college when I need a little extra spending cash. I promise I wonâ€™t spend it on beer like my dad said I would. I would also like to thank you for attending my graduation and coming to my reception. I can't wait to see you again at our next family reunion over the break. We'll have to beat the guys this time in our annual backyard football game. Take care, and I love you! Dear Grandma, Thank you for remembering my graduation. Your card was so sweet, and I certainly am thankful for the check you sent with it. I will be buying many things for my new dorm room, and a laptop for school work, so your gift is much appreciated and will be put to good use. I am so excited to be going to college and am looking forward to all the new experiences and friends I will make. I have your email address, and have added you to my "Friends" list so be looking for updates on how things are going. Thanks again for helping to make my graduation special. I hope these graduation thank you note samples have been helpful. Once you have a few written, submit them below, and we'll publish them on the site. Help inspire others by posting your best graduation thank you notes below. Here are two more graduation thank you notes that might help people out. I had to write notes to everyone who came to my graduation. 24 people!